Lifetime FREE Access, Apply Now! You're FINALLY in control again: record video, run webinars, play recorded webinars, teach, sell and market your courses or webinars through 1 integrated FREE learning platform. Upload your course, start running webinars and get FREE lifetime access - for a limited time! As A Course Or Webinar Creator? Subject: Calling All Course Creators! Somewhere between the idea... and your ability to create online courses to market, sell, and deliver your big idea. Well, I'm here to tell you that those days are back, but online! Thanks to LearnFormula. ...Take power back from tech guys! ...who don't know how to design. LearnFormula lets you easily teach live using live webinars, recorded auto-webinars through 1 platform. Pick one of LearnFormula scientifically pre-designed course pages, sell YOUR videos, or CREATE content while teaching webinars that turn into courses. Watch your sales SOAR! Choose a page design style that you think students will prefer... add your content, and easily you'll look every bit as good as the ones "designers" charge you an arm-and-a-leg to create for you. Click the Get Started button, and your online course, webinar, or event is ready to roll in less than 10 seconds! It s as simple as 1,2,3! Plus, at any time, you can change headlines, add images and videos, insert countdown clocks, and many more engaging and interactive aspects to customize it for your audience and maximize your results. You can start running webinars immediately, and on-board as many courses you'd like. And if you REALLY want to tailor your course pages, LearnFormula offers dozens of amazing elements to choose from, just like a painter would pick a color from their pallet. and when you are satisfied with what you have to put into your course, teach live! Or months (if not years) for you to figure out on your own. What's the best salesperson in the world? allows you to teach live to your audience! LearnFormula lets you take the power back from tech guys! It gives you the power to turn your ideas into reality and results...and into money. ...You can kiss your Website, shopping cart, and email autoresponders goodbye, too! ALL the stuff all the other tools did, but for a fraction of the cost! You seriously can't miss out on this opportunity. Then, I invite you to use LearnFormula. Your free LearnFormula account offers dozens of themes They are scientifically proven to turn Website visitors into current and recurring customers. Want to be the best online teacher? There's a theme for that. Want to capture leads, so you can sell courses and services? There's a theme for that, too! Sell a product? Sell a service? Sell to other businesses? Yep, there are themes for all of those! Just imagine the next time you have a great idea or have a new course to sell. LearnFormula can do it all for you in minutes. With just a few simple clicks, you can create a beautifully designed course that converts Website visitors into completely satisfied customers. You can finally turn your ideas into reality, live your dreams, and share your knowledge and experience with others! No longer are you restrained and held hostage by tech people, you can take control of your marketing and start making sales TODAY! At LearnFormula, we believe that's how it should be... ...and we're putting the power back in YOUR hands. As a teacher, your time is valuable. Have you tried other tools that promised you the world when it comes to online course inception to delivery? But they didn't do what was promised? Even after spending tons of money and submitting several support tickets? I don't know about you, but I think Einstein said it best... "Repeating the same things and expecting different results is the definition of insanity." Try LearnFormula today. Do you have a couple minutes? That's all it takes to create your first course, event or webinar now! P.S. - Are you still uneasy about getting started? If so, then keep reading to understand what you can do to be successful as an educational entrepreneur! get stuck when it comes to your online courses. no one wants to fail, teachers or students! With LearnFormula, there's no need to have a fear of failure. Everyone knows the Internet is the place to go when you have something to offer and to make money. However, do you have what you need to successfully build, market, sell, and deploy your product, in this case online courses? LearnFormula has everything you need — at a $0 upfront. Who needs to waste time and be stressed out? Not you! Educators already have enough of that in their lives. 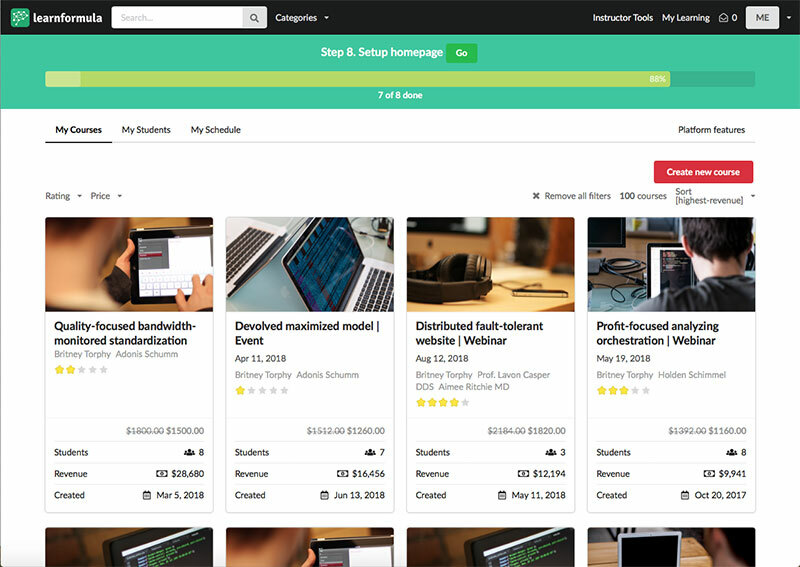 Use LearnFormula to quickly get YOUR educational content in the online marketplace! "I can't do that. I don't even know how to use my cell phone, let alone my computer!" Do you know how to click a button on the Internet? That's all you need to know. Ever wasted time on something? Don't want to put a ton of work in to get little/no results? I don't think I can do it"
IDK how LearnFormula can work for me"
I know what you're thinking LearnFormula is great for Internet marketers but how can it work for me and my business? but ran out of money..."
Have you taken your idea and started to turn it into a reality, but got stuck because you ran out of money? Blown money on something that was supposed to work, but didn't? Spent money on a dozen different things and it spread you too thin? "I don't understand programming I can't hire an expensive one to build what I need..."
You aren't a master programmer? No interest in learning programming or spending hours working with complex code or hiring an expensive programmer to do that for you just to wait weeks or months for them to finally finish your project? "I need to know design or need to hire an expensive designer to build my Website..."
Not a design expert, or don't have money to hire one? LearnFormula takes care of almost all the design aspects for you so you just build and go! "I don't have money to spend on ads..."
Don't have a huge budget for ads? Want to get tons of eyeballs on your offer without spending a fortune? LearnFormula is perfect, whether you're using free traffic OR paid traffic! Here's a secret no matter what you've been told, I'll bet you DO NOT have a traffic problem! You most likely have a conversion problem and LearnFormula instantly solves that problem by turning Websites into money dispensers, to the tune of 540% more money from a LearnFormula Website than a regular one! That's with the SAME EXACT traffic! Even if you've tried everything you can think of to get traffic and failed to convert it, you CAN with LearnFormula! Want to know the best way to find out if your offer will work? Try LearnFormula! "I've tried web marketing in the past and it didn't work..."
Heard the expression, "You're Just One Theme Away..."? Here's the truth: not every theme you build will make you rich. Competition is a GOOD thing! It means people are spending money and buying things. Whatever it is you're offering, using LearnFormula lets you quickly get your message in front of those people who are already buying to buy YOUR product or service instead! "I have/had a website or theme and it didn't work..."
Did you know that a Website without a back-end pumping out sales is the main reason they fail to make money? For every $100 a normal Website makes, a LearnFormula Website makes $640! "I'm really close to succeeding, but I don't have a ton of money to keep this going..."
You have two options. Quit and abandon all the work, time, and energy you put into it. "I Don't Have Enough Money To Start..."
Have any of the above stopped YOU? Are you ready to finally succeed online? Start running FREE WEBINARS using LearnFormula, which you can convert into courses. We'll get you to be a pro at marketing, selling, and delivering your online courses. After you try it, remember, there are no tricks - There are no monthly fees with LearnFormula! LearnFormula has thousands of REAL people (just like you) who make a living running webinars and events or offering online courses. Take Over His Parents Business..."
"I was literally living in an electrical room in the back of an office building. 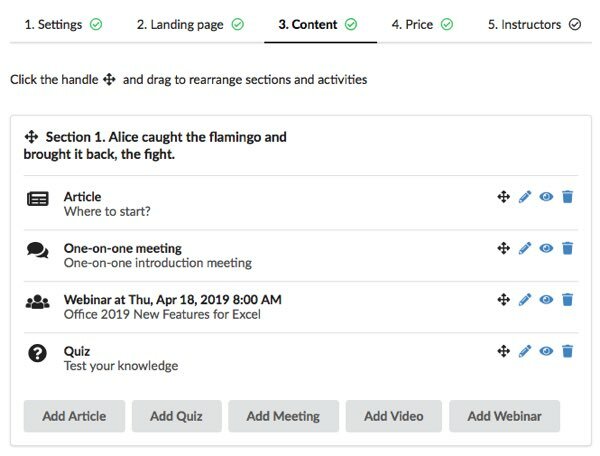 LearnFormula eliminates 90% of the hard work tech teams would put into online courses because its plug-n-play, proven templates let you be up and running in just minutes. Anyone can figure out LearnFormula! Farmers, fire-fighters, retired teachers, ANYBODY you can think of... are using it. With LearnFormula's community of more than 10,000 like-minded people who want to have success with online teaching and courses, you're instantly surrounded by folks who "get you" and provide support and help along the way. LearnFormula has everything you need, and getting setup is quick and easy. LearnFormula WILL help you succeed. You definitely need to try LearnFormula. As soon as you realize what it can do for you... you'll wonder how you ever made it without LearnFormula! we've got all the templates and tools you need! "It didn't happen overnight for me, but each theme I launched got better and better. "I was trying to change the world, but I couldn't even afford Christmas for my kids. LearnFormula Websites (with an order form bump, upsell, and downsell) make 360% more money than a normal Website! With LearnFormula, all you need to do is plug in your course videos, logo, or text and you're good to go you can also teach live and create content as you go. It's easy editor includes beautiful buttons, sections, and templates to build from. LearnFormula literally takes the need for a tech developer or programmer completely out of the picture! and save! Building Live Webinars, Courses and themes literally couldn't be easier. and money you could save. LearnFormula has members making millions in sales without spending one dime on advertising, using our powerful conversion tools (like built-in split-testing, order form bumps, live teaching through webinars, and more). 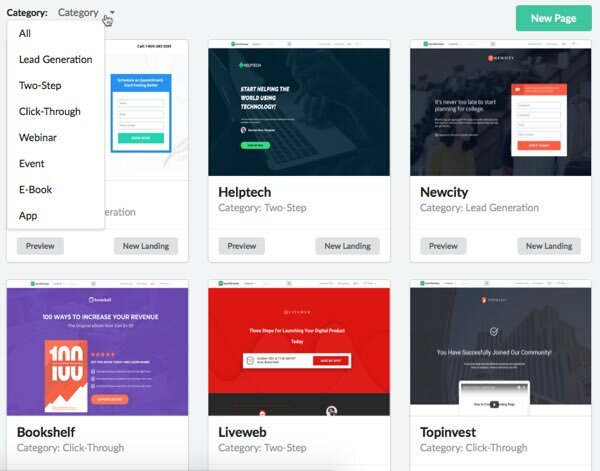 You'll become an expert of "Theme Hacking," which means modelling what's already working and using the right templates (all included inside your private membership area) to pass your competitors and never look back. Plus, you'll have FREE training included in your member's area that shows you exactly what you need to know about getting people to buy from YOU instead of all other options. So, you can sell more than you ever thought possible. LearnFormula combines ALL the important course software tools you actually need, plus ONLY the training you actually need. 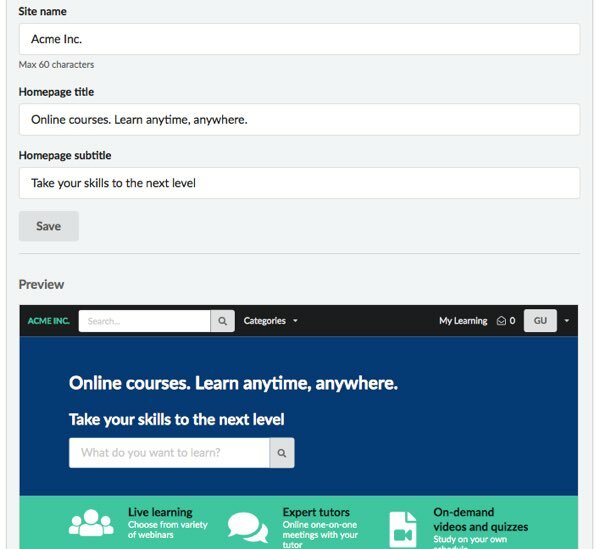 See for yourself just how easy it is to start teaching and offer courses with LearnFormula's incredibly simple, effective software. LearnFormula makes it almost impossible to fail. But my goal isn't to 'SELL' you LearnFormula. You can try LearnFormula for FREE to see if it work for you and your business! Yes, that means you can get your own LearnFormula account and play with everything it has to offer. If it doesn't completely simplify your life, increase your revenues, and help you to FINALLY have course formulas that convert, then let me know anytime (or heck, you can even bypass me and cancel from the dashboard). Let me tell you about everything you'll get with LearnFormula! There is NO catch. 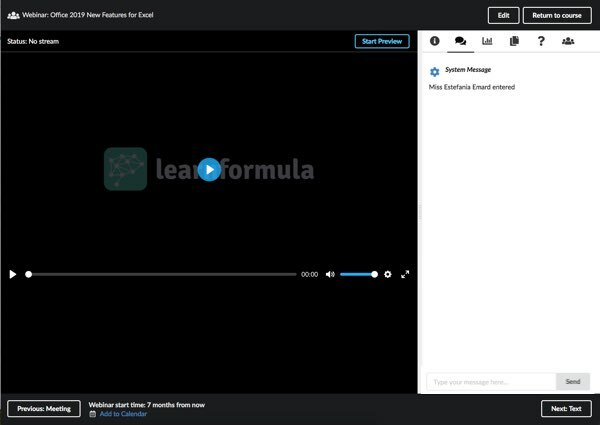 I'm letting you test drive LearnFormula FREE because I know that after you start using the platform, you'll wonder how you ever survived without it! Of course. I guarantee that you'll LOVE LearnFormula, and if for some reason you decide later that you don't want to be a member anymore, then I'll happily cancel your account without any penalties or fees. I don't believe in any long-term contracts, so you can come and go as you please. Finalize the details. Click on the button below, pick a theme, and get started! Thanks for your time. I look forward to hearing from you soon! No! LearnFormula offers free updates to its software, as well as adds new, free templates! 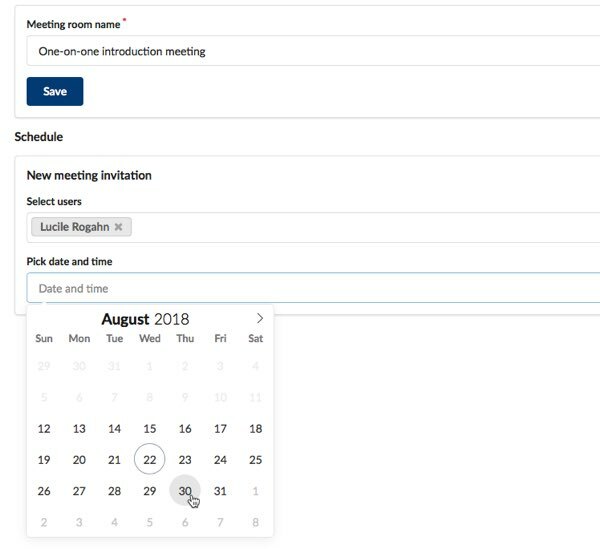 LearnFormula is on the Cloud, so updates and features can be added automatically! There are NO long-term contracts or commitments. You can use LearnFormula month-to-month, and cancel at any time! If I cancel my LearnFormula account, will I lose my data? As with most "software-as-a-service" platforms, when you cancel your account, your data will become inaccessible. But don't worry, before cancelling you have the opportunity to download csv files of your contacts and members or "pause" your account. LearnFormula will back up everything, so you can come back again later! Can LearnFormula handle all my information? Yes! LearnFormula is hosted on the largest, public cloud cluster in the world (powered by Amazon and backed up by CloudFlare Security + CDN). It has virtually unlimited ability to scale in real time. Whether you send 100 visitors or 100,000+ today, it doesn't slow down! Can I host the pages? 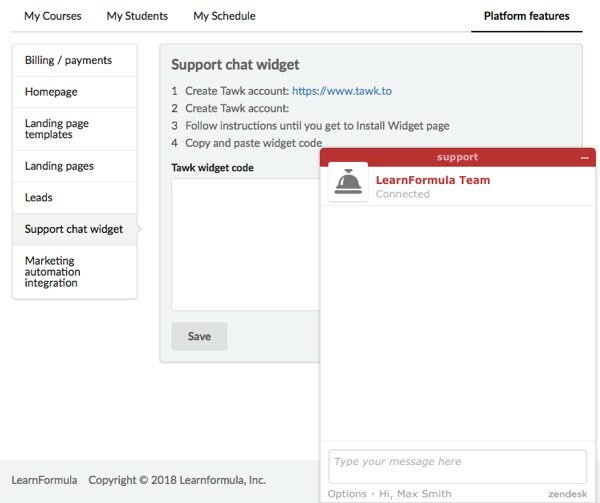 No, LearnFormula is a hosted, "software-as-a-service" platform to make sure you get all the updates and features, and themes won't break. You can also export the html from any of your pages, as well as your contacts, anytime you want. Yes! LearnFormula has a first-class support team that can answer your questions 24 hours a day, 7 days a week! Just click the "Support" link on the bottom of any pages or go to http://support.LearnFormula.com. No! Just login, start clicking, and build all the pages in your theme from the members area! You do! Any content (including your users) is 100% owned by you. LearnFormula doesn't have permission to use that content or contact your users for any reason. LearnFormula is just a tool for YOU to deliver YOUR content and TEACH live. If I don't like LearnFormula, how do I cancel? Simply login to your account, click on your account settings, and click "cancel my account." No need to call, email, or talk to anyone!